I am cleaning up the back workroom. I need more room for my art craft supplies. We have old sewing machines, sewing machine bits and pieces like bobbins, feet, bobbins, shuttles, thread, and other parts all mixed up in boxes. John disassembled all the sewing machines to use the cast iron bases for his furniture redesigns. He actually had thirteen machines bases. Sometimes he had to take the machines, but most of the time he left them, the lights, cords, etc. with the seller. Now in retrospect, I wish we had taken all that with us, but, as you know you can just hoard so much stuff. We did take most of the cabinets John wanted those to make the sewing machine drawer boxes. However, the remaining cabinet woods were veneer and brittle, and we could not save many of those old cabinets. I recently had a lady from Texas call me regarding an old Singer sewing machine I have for sale at our Etsy store. I cleaned and waxed the machine and John built a box base for it. It is intended for use as a decorative item. If I could have shipped this item to her for less than the cited postage, she would have bought it. She really did love it and I was sad she couldn’t get it. But she did inform me of communities on and offline that collect and refurbish vintage machines. Some actually use them to sew. Others make decorative items of them and still others paint and decorate them in wild outlandish styles. I was blown away by what she told me. I never imagined such a vital and active collectors group. By the way, Google or Pinterest ” pimped out sewing machines”. The results are amazing!! I found a good many clubs in Texas that are into the old machines. Apparently, sewing circles, quilters, and collectors of vintage machines are all out there…who knew. I have some pictures of the few we have cleaned up and waxed. Today I went to Fred’s antique Store in Green Ohio….like my guy Patty In Wexford…a big old building and house with tons of stuff!!! He has two sewing machines in the dark recesses of his barn. I did get a good look at a machine I never heard of – It was in a hand case. The Western Electric sewing machine was not made by Western Electric but by the National Sewing Machine Company, Belvedere, Ill., will have to look into this more at a later time. But contact me if anyone in the Ohio area is interested in this seemingly intact machine. BUT I found this lovely old machine cabinet. I am going back for this one. The corner was so dark I couldn’t see the machine. BUT there was a wood sewing table- a Martha Washington Sewing Table with the badge id inside. Now that I want a good look at. “QUESTION: My great-grandmother used this piece of furniture as a sewing cabinet. I’m interested in its age and use. The drawers have spaces for wooden slats—one side a round hole and the other side of the drawer has a slot. 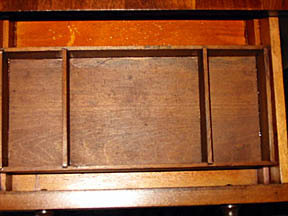 The side compartments are finished inside and may have been used to store fabric. What can you tell me about this piece? ANSWER: You, indeed, have a sewing cabinet, a Martha Washington sewing cabinet to be exact. And while it takes Martha’s name, it isn’t much like the one Martha, herself, used. Her original sewing cabinet was a small work table with an open shelf space in the middle with no drawers set between two storage compartments. A fabric skirt, draping to the floor, shielded the shelves. Your cabinet is a Depression era reproduction of a table made in 1815. However, Martha Washington died in 1802. Today, Martha Washington sewing cabinets generally have two or more drawers in the center flanked by half round compartments on each side of the cabinet that is covered by a shaped lid attached by concealed hinges. These side compartments, called project pockets, held fabric, needlepoint or knitting projects in progress, plus they were long enough to hold knitting needles. These handsome little cabinets came in many similar designs. Some had nicely turned legs while others had plain ones. Matching wooden or glass knobs adorned the drawers, which, themselves, often varied in size and depth. Often the top drawer contained a removable thread holder. Makers produced them from the early to the mid-19th century in walnut or mahogany. Some came with drawer inserts, and other didn’t. Made to fulfill a practical purpose, they became popular with women who liked their small size and maximum storage ability. The versions of this cabinet that mostly appear on the market today have three drawers and two flat top lids, which incorporated the “Soss” type invisible hinge, patented in November 1911, over the material compartments. The drawers can be either three different descending sizes, the smallest on top, or three of the same size. While thread holders appear in some, they’re not in all. Generally, they measure 27 inches wide, 14 deep, and 29 inches tall. In 1915, the Cowan Manufacturing Company of Toledo, Ohio, advertised their mahogany version for $12.50. 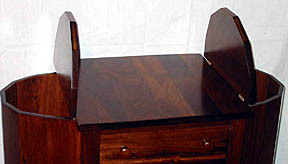 In the mid-1920s, furniture manufacturers began making small, relatively inexpensive pieces such as magazine racks, tea carts, and smoking stands that people could afford to buy during the Great Depression. Known as the “novelty” furniture movement, it helped keep production going when customers could no longer afford to purchase dining room or bedroom sets. Green furniture & antiques Massillon rd. The cabinet needs a lot of cleaning and a bit of restoration. Will let John work his magic on it and then I’ll get onto the sewing machine itself. I do believe this one may be in working order! This post is getting a bit long so I will end for today. I will keep you all informed of our progress in the mini restoration. I hope we can find a nice home for Martha.